ِdo you see the light? Posted in Civilization, democracy | Tagged: http://www.communitym.com/article.asp?article_id=101438 | Comments Off on ِdo you see the light? Though three months of Arab revolt against autocratic leaders, it’s become commonplace to say that the only clear strategic winner from the changes so far is Iran, supposedly picking up windfall political fruit as if sitting in an armchair. Click below to find out more about Iran’s complex political system. Of a total population of about 65 million, more than 46 million people – all those over 18 – are eligible to vote. Young people constitute a large part of the electorate with about 50% of voters being under 30. Voter turnout hit a record high at 80% in the 1997 elections which delivered a landslide victory for reformist President Mohammad Khatami. Women and young people were key to the vote. 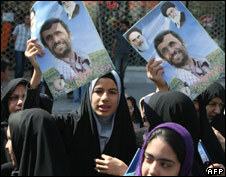 But with disillusionment growing, only about 60% of the electorate voted in the final round of the 2005 election which brought hardliner Mahmoud Ahmadinejad to power. To discover what is going on behind the seen one should look at the events and the core Media warns of Iran’s authority raise in the territory and at the same time encourages us to oppose and help us for uprising why? If Iran is becoming strong with increase of influence in a territory once was the Empire why should we have a revolution? By using the wealth of one and half billion humans of nations undeserved for a better life? That the Islamic or Christianity or Jewish culture of countries undermined by communist regimes has been dissolved? That individuals, persons and government shall submit to, obey and be regulated by law, and not arbitrary action by an individual or a group of individuals. Thank you, Congressman. And I appreciate your raising the continuing threat we see from Iran. While we are focused on the developments in North Africa and the Middle East, we have to continue to keep focused on Iran. And we certainly are. What we see happening right now – and I can only give you that snapshot, because our assessment now is that the internal discord in Bahrain is a domestic phenomenon that comes from the demands by the 70 percent Shia population for greater political rights, greater economic opportunities, and it requires a domestic solution. So what we’ve been doing is working with Bahrainis to work with themselves to try to come up with a way forward. Now, there is no doubt, as we have publicly and privately expressed, all people, according to our values, have a universal right to express themselves, to associate…assemble freely. And so, we have urged the government of Bahrain to respect those rights. At the same time, we have also credited what the government is trying to do through a national dialogue to come up with some agreed-upon reforms that would be implemented. You know, Bahrain is a friend, they are an ally, we deeply value their long-time association with us. King Hamad has announced that Crown Prince Salman is to lead this national dialogue, and we are encouraged by some of the steps we have seen recently, that this can result in a genuine dialogue. American puppets must stay in power! But this is the whole process of learning! Posted in democracy | Comments Off on Don’t you dare sensible?